Once it has been designed and installed, the HVAC system is something the facility manager has to live with for a long time. Heating and cooling equipment has a long life cycle, and because of the cost of replacement, it may well be kept in service even after the end of its projected useful life. That’s why it’s so important for facility managers to understand their choices when HVAC systems are being planned. For facility managers looking ahead to construction or retrofit projects, three developments are worth noting: the growing use of variable refrigerant flow systems, the move to reduce the use of HFC refrigerants, and new standards for pump efficiency. Pumps are getting new attention. These workhorses of the building infrastructure offer an important opportunity for energy efficiency. New federal standards will drive efficiency gains industry-wide, but even before those standards take effect, it’s important for facility managers to understand how good pump system design can save energy. On Jan. 25-26, 2016, the U.S. Department of Energy published its Final Energy Conservation Standard and Test Procedure for Pumps in the Federal Register. Compliance with the new standard is slated for January 2020. The new standard and test procedure applies to clean water pumps. Under the standard, new pumps must have a Pump Energy Index (PEI) of 1.0 or less. With this standard, DOE now has set minimum efficiency standards for commercial and industrial pumps that the agency claims amount to a savings of 1 percent relative to pump energy use without the standard. While 1 percent seems a small number, pumps are used in so many systems that the improvement adds up to a considerable savings. DOE estimates that the lifetime energy savings for pumps purchased over 30 years following the effective date for the new standard amounts to 0.29 quadrillion Btu. Peter Gaydon, technical director of the Hydraulic Institute, translates that into 85 billion kilowatt hours. “By law, at least 25 percent of present pumps will be eliminated” because they will not meet the new standards, says Gaydon. According to DOE, the new standards offer significant environmental benefits, resulting in cumulative greenhouse gas emission reductions of 17 million metric tons of carbon dioxide, 9.5 thousand tons of sulfur dioxide, 31 tons of nitrogen oxides, 75 thousand tons of methane, as well as emission reductions for nitrous oxide and mercury. In just 10 years, DOE estimates the cumulative reduction in carbon dioxide alone for pumps with PEI of 1.0 or less is the equivalent to the emissions resulting from annual electricity use in more than 370,000 homes. Gaydon explains that PEI is calculated several different ways, depending on whether the number applies to a bare pump, to a pump with a motor, or to a pump with both a motor and controls. “But under each of these conditions, the PEI still must be 1.0 or below,” he explains. Design elements can greatly affect a pump’s efficiency, according to Gaydon. Leakages can be prevented and friction inside the pump can be decreased, for example. But the primary improvements to be found in more energy-efficient pumps are their hydraulic impellers and diffuser hydraulics. In addition, efficient pumps also use better motors and controls, typically with variable frequency drives. By upping the standard, new pumps that pass testing procedures will have the potential to significantly reduce electricity use and may qualify for utility incentives such as rebates. Pumps also may be misapplied. 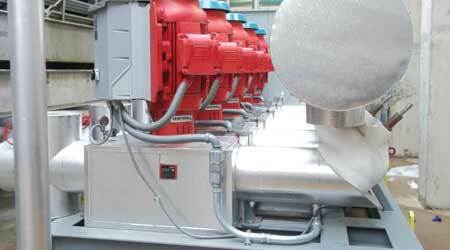 For instance, if the system requires a constant flow rate, a variable speed drive is not an efficient application. The designer and the facility manager need to look at the system first, then choose a pump that matches those parameters. “Applying the right pump to the right application is critical for performance,” asserts Gaydon. To illustrate his point, Gaydon offers this hypothetical situation. Company A offers a 100-gallon per minute pump that’s 90 percent efficient, while Company B offers a 50-gallon per minute pump at 75 percent efficiency. If the application needs 50 gallons per minute, the larger pump may not be the best choice, even though it has a much higher initial efficiency rating. “To operate at the lower rate, Company A’s pump will be working harder in throttling to the flow rate required and maintaining a higher head on the pump, using more energy,” he explains. “You need a system approach so that you select the right product and controls to operate most efficiently with reliability,” insists Gaydon. To assist facility managers and engineers in evaluating similar pumps, the Hydraulic Institute and its partners hope to launch an efficiency measurement system in 2017, three years ahead of compliance. Although the particulars are not finalized, Gaydon suggests the new efficiency rating program would be similar in concept to the SEER labels on appliances. The concept is to build on DOE’s regulations so that procurers can choose a pump based on its energy performance, which may be in excess of DOE requirements. Top photo caption/credit: A new chiller and cooling tower installation with vertical, variable speed pumps with integrated drives helped Methodist Dallas Medical Center reduce its cooling costs by more than $100,000 in five months. The vertical in-line design made it possible to install five pumps in a space that is about 6 by 15 feet. Credit: Armstrong Fluid Technology.